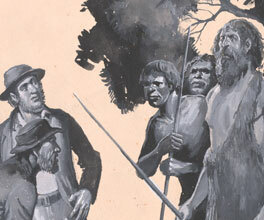 Roughly a year after he escaped from the convict settlement at Sullivan Bay, William Buckley met two Aboriginal women from the Wathaurung people. The women thought Buckley was the reincarnated spirit of their kinsman – possibly because Buckley was carrying his spear which he had found near the Indigenous man's burial mound. I became as expert as any of them in spearing the Kangaroo and taking fish – and with regard to the latter was generally more successful [than any of them] when fishing alone. Buckley, W 1837, Reminiscenses of James Buckley, Manuscripts collection, State Library of Victoria, MS13483. In accounts of his life, Buckley often talks about catching eels near his hut. A waterfall and a bay near Barwon Heads are named after him, and tourists still visit the cave where he lived almost 200 years ago. After a few years residence among the natives I could speak the language quite well – when I had attained this knowledge of their tongue, I was fast losing my own. When [Buckley] was taken away in the ship, the natives were much distressed at losing him, and when, some time after, they received a letter informing them of his marriage in Hobart town, they lost all hope of his return to them and grieved accordingly. Dawson, J 1881, Australian Aborigines, the language and customs of several tribes of the Aborigines of the Western District of Victoria, Australia, George Robertson, Melbourne, Vic. His ability to communicate with the Aborigines earned him the nickname ‘Wild White Man', and led to him later becoming an interpreter and negotiator for John Batman and other early settlers. After 32 years living in an Aboriginal community, William Buckley found himself stranded between two cultures. William Buckley's mysterious life has long been an inspiration for writers and historians alike. Escaping from a convict settlement was William Buckley's first step towards becoming the ‘Wild White Man'.